Verdict on the iOS release of 2008′s breakthrough indie hit. If ever there was a platform that deserved a level-based puzzler full of charm and polish, it’s the iPhone. Trudging through the top games list on the App Store always reminds me of grocery shopping: it’s not particularly exciting, and all the produce looks the same, but you feel it’s necessary nonetheless. So then, the average consumer would be forgiven for writing World of Goo off as another Angry Birds or Cut the Rope. Thankfully, any gamer who frequents these parts will know that isn’t the case. 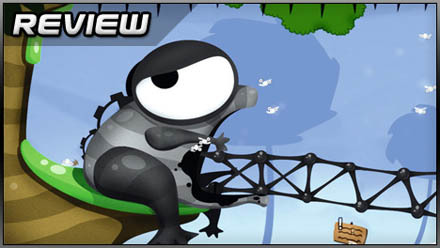 Not a whole lot has changed since World of Goo’s debut on the PC and Wii back in 2008, but for newcomers, I’ll explain. 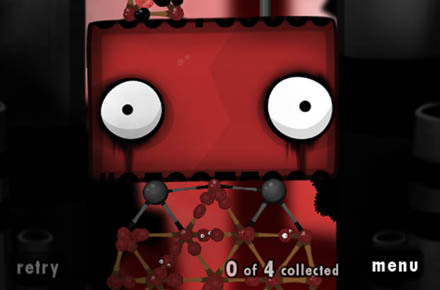 In short, the player must assemble a construct to get from A to B using a number of viscous blobs (“gooballs”) that act as architectural joints. In each level, you’re given a set number of said gooballs, with the aim to use as few as possible whilst avoiding the obvious traps en route to a pipeline that represents the exit. The difference in this iOS edition, however, comes not from the game, but from the hardware format itself. You may find yourself wondering, as I did, why this wasn’t released for a portable device sooner. Granted, the game was fantastic on its initial platforms, but for me, it suffered from being addictive and – dare I say it – casual, without the ability for the user to play it anywhere other than in the comfort of their own home. The opportunity to clutch your phone under a bus shelter and traverse through just one more level of glorious, liquiform engineering really brings with it a whole new outlook on what it is that makes World of Goo so enjoyable. Part of the fun comes merely in the design: well-crafted levels with an inviting difficulty curve are perfectly suited for enticing players forward (a rare thing for the platform, I’d say), and the crafty do-it-yourself leaderboard adds replayability, as the player is forced to return to levels to collect every last gooball (aptly named Obsessive Completion Distinction). You could argue that after 2 years, 2DBoy should have included a few extra levels as an incentive for players of the original to re-purchase, but I found I was more than happy to rekindle my addiction without the promise of new content. That’s the kicker with World of Goo, it shares that Tetris attitude of “just one more go” without leaving the bad taste in your mouth you get with Angry Birds or SelfHarmville Farmville. The sound design is top-notch too, from the enigmatic Elfman-esque intro theme, right down to the glorious rubbery squeal of each balloon gooball. But it’s fitting when you consider the art direction and presentation. Seldom are indie titles as inspired as the realm created in World of Goo: the gooballs with their animated eyes; the structures with their buoyant fragility; the dry wit of the “Sign Painter” – it all comes together to deliver a charming experience that is currently unrivalled on the iOS platform. It is, however, initially apparent that the touch screen controls (whilst providing some level of added interactivity) come at a rather heavy price: you’ll find your finger obstructs a fair amount of the screen during play. As some may recall, the game often requires delicate and accurate control, and as a result, it can lead to frustrating unforced errors. But personally, I found it became less of an issue the more I progressed, and frankly – when taking the hardware into consideration – the developers really had no alternative. What’s astonishing about World of Goo though, is the simple fact that it’s merely £2.99. At that price, it completely goes against the current trend of labelling iPhone games as second-rate or “disposable” (as Nintendo’s Reggie Fils-Aime recently put it), and stands testament to the idea that cheaper gaming should be just as much a part of the industry as AAA titles and £40 retail releases. 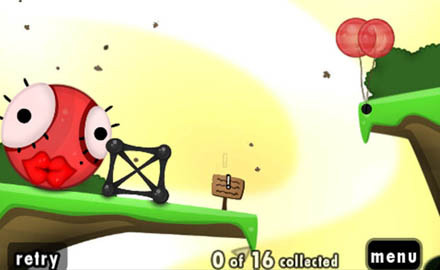 World of Goo is out now for all iOS devices. 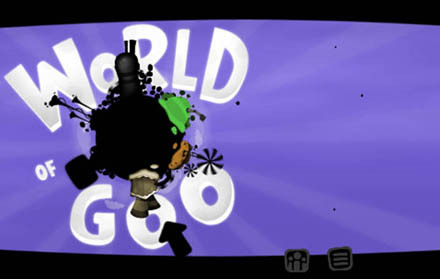 Posted in Reviews, and tagged with iOS, World of Goo.